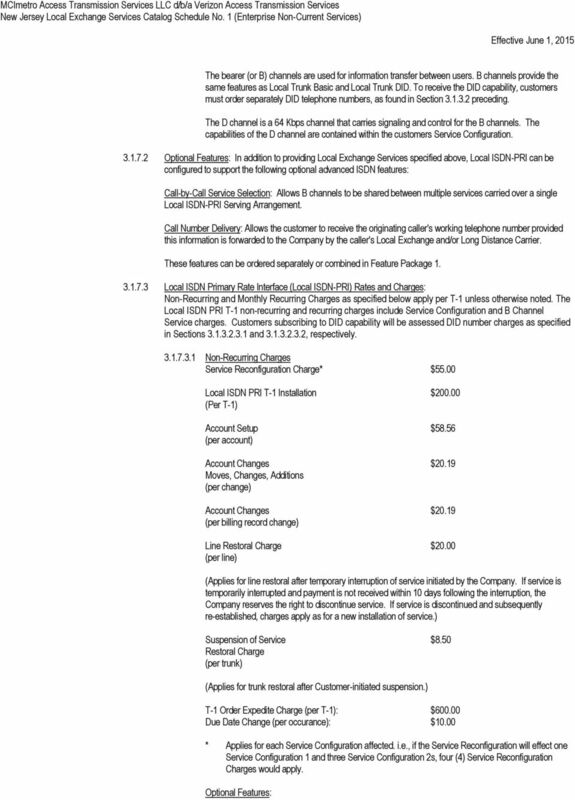 Download "MCImetro Access Transmission Services LLC d/b/a Verizon Access Transmission Services"
2 CHANGE SHEET This sheet details the most recent revisions made to this Price List. Any questions regarding this Price List, please call Revisions to Local Exchange Services Catalog Schedule No. 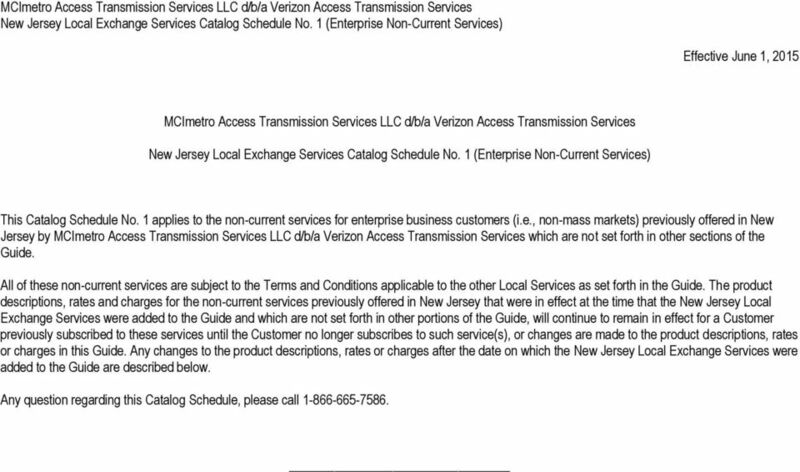 1, Effective 6/1/15: SUBSECTION A Material previously in Verizon Access Transmission Services Tariff No. 4. 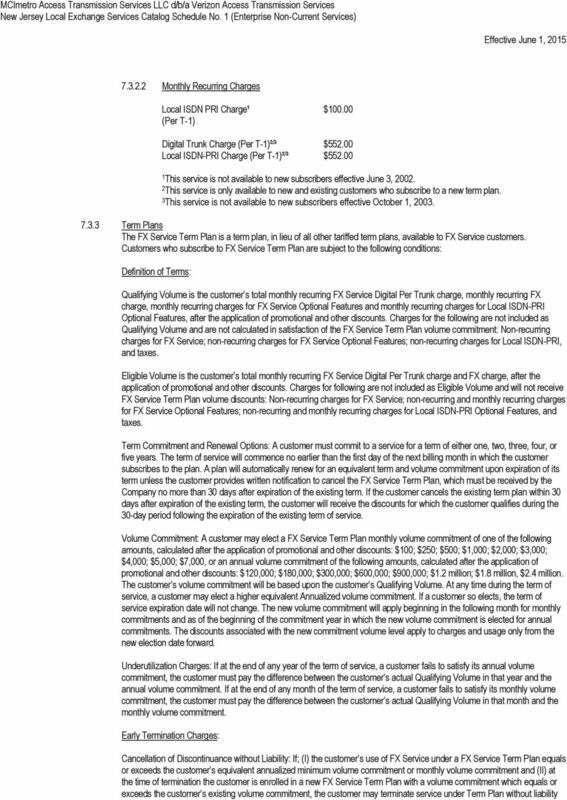 Section Increase certain monthly recurring charges associated with the Local Plus Program for Local Lines (per line), Local Trunks (per trunk and T-1) and Local ISDN-PRI (per T-1). 7 Optional Features: Digital Interface Channelization Charge (Per Channel) $ Monthly Recurring Charges Per Minute/Per Call Options $47.16 Flat With Cap Trunk $72.50 DID Number Charge $2,000 (Per Block of 1000 numbers after an initial purchase of 2000 numbers in a Metropolitan Statistical Area (MSA) from a single Company switch.) Interim Local Number Portability $0.00 (per number) Rates for a volume of numbers greater than 500 will be provided on an Individual Case Basis. 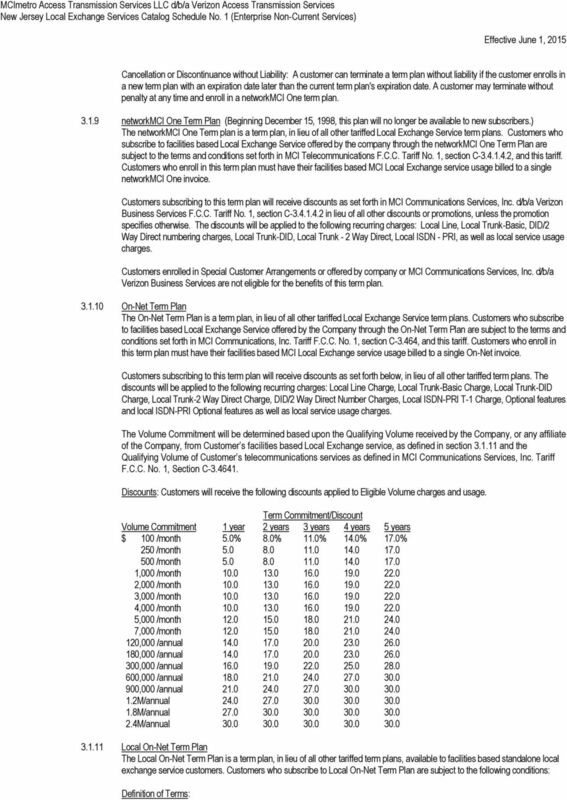 Digital Interface Channelization Charge (Per Channel) $ Usage Rates: All Local Exchange Service Customers may order service on a per minute or per call usage basis as stated below. These rates will apply to all outgoing direct-dialed calls placed to Stations within the caller's local exchange area, as defined herein. If the computed charge includes a fraction of a cent, the fraction is rounded to the nearest whole cent Per Call Usage Rate: The following rate will be applied on a per call basis, regardless of the duration of the call: Per Call $ Per Minute Usage Rates: The following rates will be applied on a per minute basis. Peak rates will apply from 8:00 a.m. through 5:00 p.m. Monday through Friday. Off-Peak rates will apply at all other times. Peak Off-Peak 1st Min. Add'l Min. 1st Min. Add'l Min. $0.037 $0.013 $0.018 $ Flat with Cap-Lines: (Effective March 1, 2001, this calling option will not be available to new subscribers.) Any customer who exceeds the equivalent of 3,000 minutes multiplied by the number of lines during a billing cycle will be billed for each additional minute at the following rate: $ Flat with Cap-Trunks: (Effective March 1, 2001, this calling option will not be available to new subscribers.) Any customer who exceeds the equivalent of 10,000 minutes multiplied by the number of lines during a billing cycle will be billed for each additional minute at the following rate: $ Local Service Term Plan (Beginning November 1, 1997 the terms and conditions of this program will only be available for those customers subscribing to a Special Customer Arrangement offered by MCI Telecommunications Corporation.) (Beginning December 15, 1998, this plan will no longer be available to new customers subscribing to new SCAs.) 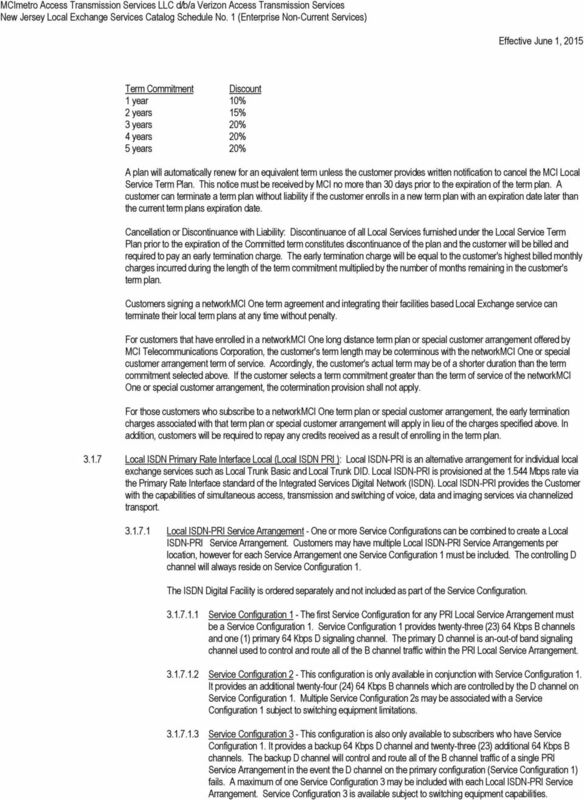 Customers who subscribe to facilities based Local Exchange Service and enroll in a Local Service Term Plan are eligible to receive the discounts described below on specific monthly recurring and usage charges based on the customer's term commitment. The customer must commit to service for a term of either one, two, three, four, or five years. The term of the Local Service Term Plan will commence no earlier than the first of the next billing month in which the customer subscribes to the plan. 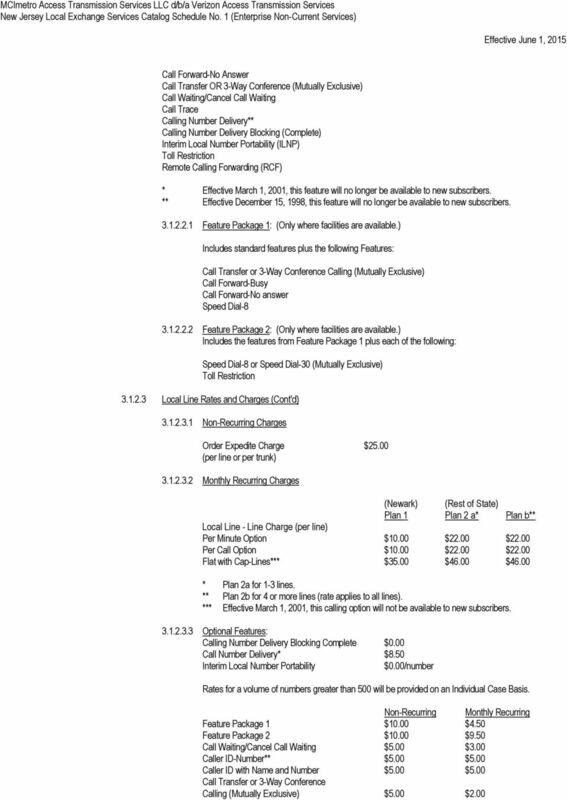 The customer will receive the following discounts in lieu of all other discounts or promotions except for the Local Customer Assurance Promotion on the following recurring charges: Local Line, Local Trunk-Basic, DID/2 Way Direct numbering charges, Local Trunk-DID, 2 Way Direct, Local ISDN Primary Rate Interface (Local ISDN-PRI), and usage charges. 8 Term Commitment Discount 1 year 10% 2 years 15% 3 years 20% 4 years 20% 5 years 20% A plan will automatically renew for an equivalent term unless the customer provides written notification to cancel the MCI Local Service Term Plan. This notice must be received by MCI no more than 30 days prior to the expiration of the term plan. A customer can terminate a term plan without liability if the customer enrolls in a new term plan with an expiration date later than the current term plans expiration date. Cancellation or Discontinuance with Liability: Discontinuance of all Local Services furnished under the Local Service Term Plan prior to the expiration of the Committed term constitutes discontinuance of the plan and the customer will be billed and required to pay an early termination charge. The early termination charge will be equal to the customer's highest billed monthly charges incurred during the length of the term commitment multiplied by the number of months remaining in the customer's term plan. Customers signing a networkmci One term agreement and integrating their facilities based Local Exchange service can terminate their local term plans at any time without penalty. For customers that have enrolled in a networkmci One long distance term plan or special customer arrangement offered by MCI Telecommunications Corporation, the customer's term length may be coterminous with the networkmci One or special customer arrangement term of service. Accordingly, the customer's actual term may be of a shorter duration than the term commitment selected above. If the customer selects a term commitment greater than the term of service of the networkmci One or special customer arrangement, the cotermination provision shall not apply. For those customers who subscribe to a networkmci One term plan or special customer arrangement, the early termination charges associated with that term plan or special customer arrangement will apply in lieu of the charges specified above. In addition, customers will be required to repay any credits received as a result of enrolling in the term plan Local ISDN Primary Rate Interface Local (Local ISDN PRI ): Local ISDN-PRI is an alternative arrangement for individual local exchange services such as Local Trunk Basic and Local Trunk DID. Local ISDN-PRI is provisioned at the Mbps rate via the Primary Rate Interface standard of the Integrated Services Digital Network (ISDN). Local ISDN-PRI provides the Customer with the capabilities of simultaneous access, transmission and switching of voice, data and imaging services via channelized transport Local ISDN-PRI Service Arrangement - One or more Service Configurations can be combined to create a Local ISDN-PRI Service Arrangement. Customers may have multiple Local ISDN-PRI Service Arrangements per location, however for each Service Arrangement one Service Configuration 1 must be included. The controlling D channel will always reside on Service Configuration 1. The ISDN Digital Facility is ordered separately and not included as part of the Service Configuration Service Configuration 1 - The first Service Configuration for any PRI Local Service Arrangement must be a Service Configuration 1. Service Configuration 1 provides twenty-three (23) 64 Kbps B channels and one (1) primary 64 Kbps D signaling channel. The primary D channel is an-out-of band signaling channel used to control and route all of the B channel traffic within the PRI Local Service Arrangement Service Configuration 2 - This configuration is only available in conjunction with Service Configuration 1. It provides an additional twenty-four (24) 64 Kbps B channels which are controlled by the D channel on Service Configuration 1. Multiple Service Configuration 2s may be associated with a Service Configuration 1 subject to switching equipment limitations Service Configuration 3 - This configuration is also only available to subscribers who have Service Configuration 1. It provides a backup 64 Kbps D channel and twenty-three (23) additional 64 Kbps B channels. The backup D channel will control and route all of the B channel traffic of a single PRI Service Arrangement in the event the D channel on the primary configuration (Service Configuration 1) fails. A maximum of one Service Configuration 3 may be included with each Local ISDN-PRI Service Arrangement. Service Configuration 3 is available subject to switching equipment capabilities. 10 Non-Recurring Optional Feature charges are assessed once per customer location regardless of the number of arrangements or Service Configurations installed. Per Location Call-by-Call Option $ Calling Number Delivery $ Feature Package 1 $ (Includes Call-by-Call & Calling Number Delivery) Monthly Recurring Charge (per each line path) Remote Call Forwarding (RCF) $20.00 Overflow Routing Monthly Recurring Charges Per T-1 Local ISDN PRI T-1 Flat with Cap-Trunks Option $1, Local ISDN PRI T-1 Per Minute/Per Call Options $ Optional Features: Recurring Optional Feature charges are assessed once per customer location regardless of the number of arrangements or Service Configurations installed. Per Location Call-by-Call Option $75.00 Calling Number Delivery $ Feature Package 1 $ (Includes Call-by-Call & Calling Number Delivery) Intellispan Primary Rate Interface (Local ISDN-PRI) Rates and Charges Usage Charges: The rates and charges specified in Section for local usage will apply to circuit switched voice calls. Flat with Cap-Trunks is available for voice traffic only. 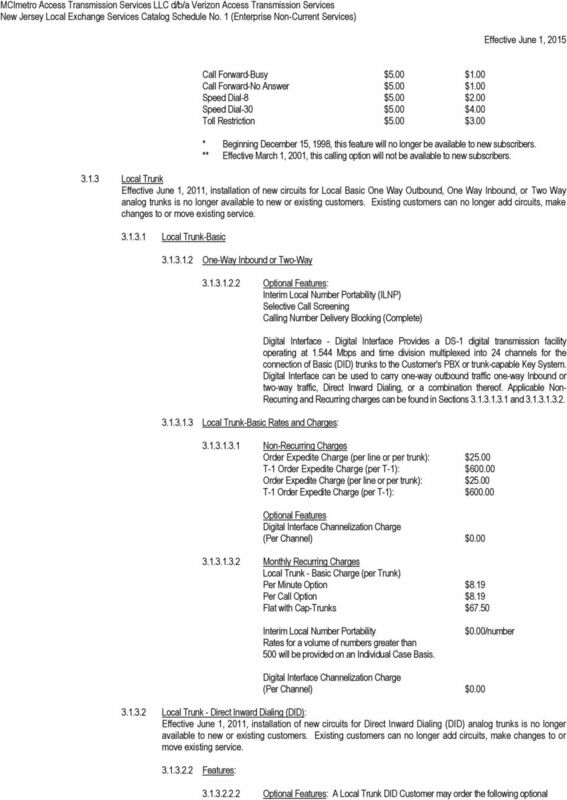 Data usage will be charged on a per minute basis as specified below regardless of the trunk type (measured or Flat with Cap-Trunks) purchased Per Minute Data Usage Rate: $ Local Exchange Service Term Plan 2 (Beginning December 15, 1998, this plan will no longer be available to new subscribers.) A Customer who subscribes to facilities based, stand-alone Local Exchange Service and enrolls in a Local Service Term Plan is eligible to receive the discounts described below on specific monthly recurring and usage charges, based on the customer's term commitment. The customer must commit to service for a term of one, two, or three years. The term of the Local Service Term Plan will commence no earlier than the first day of the next billing month in which the customer subscribes to the plan. The Customers subscribing to this term plan will receive the following discounts in lieu of all other discounts or promotions, unless the promotion specifies otherwise. The discounts will be applied to the following recurring charges: Local Line, Local Trunk-Basic, DID/2 Way Direct numbering charges, Local Trunk-DID, Local Trunk - 2 Way Direct, Local ISDN - PRI, as well as local service usage charges. Term Commitment Discount One Year 5% Two Year 10% Three Year 15% A plan will automatically renew for an equivalent term unless the customer provides written notification to cancel the MCI Local Service Term Plan. This notice must be received by MCI no more than thirty (30) days after the expiration of the term. Cancellation or Discontinuance with Liability: Discontinuance of all Local Services furnished under the Local Service Term Plan prior to the expiration of the committed term constitutes discontinuance of the plan and the customer will be billed and required to pay an early termination charge. The early termination charge will be equal to the customer's highest billed monthly charges incurred during the length of the term commitment multiplied by the number of months remaining in the customer's term plan. 14 Applicable non-recurring charges apply to services under the Verizon Business Services I Flexible T1 as specified in local trunk basic, local trunk DID, local trunk 2 way direct sections. Customers are eligible to utilize the Local Installation Waiver Plan. The Company will waive the one-time installation charges which include Port charges and/or DS1 local loop access associated with the implementation of Local (including Local Lines or Local Trunks), Integrated Internet Access*, Private Internet Protocol* Services within the 48 contiguous US States under this Agreement. Customer will receive the waiver for the length of the contract term. Usage charges, monthly recurring charges, expedite charges, change charges, surcharges, any charges imposed by third parties (including access, egress, jack, or wiring charges), taxes or tax-like surcharges, or other Governmental Charges will not be waived. * Not regulated Verizon Business Services Versatile T1 (Beginning October 5, 2005, this service is no longer available to new customers.) Verizon Business Services Versatile T1 ( Versatile T1 ) is an integrated solution for small businesses. Customer must order a minimum of 8 circuits, 4 of which must be local lines or trunks, and one of which must be Internet Dedicated Access, and a maximum of 24 circuits based on Packages A, B, or C as detailed below. 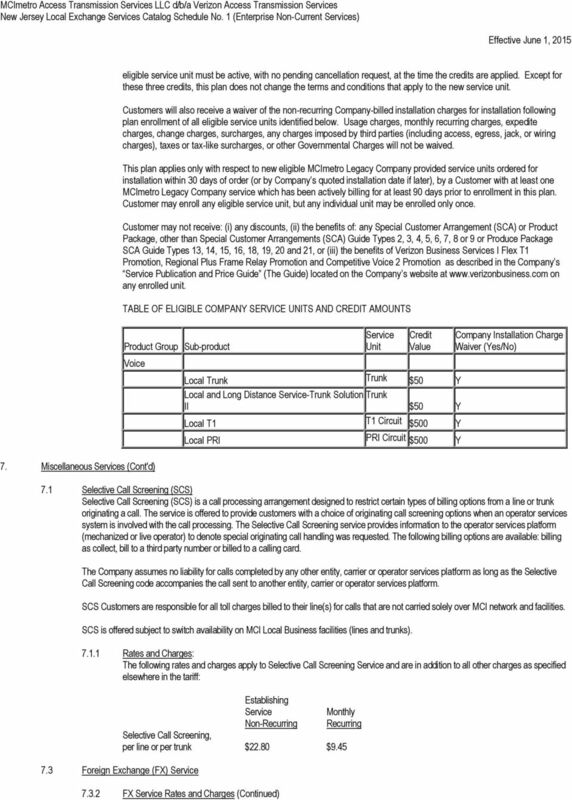 Eligibility Customer must subscribe to service under, MCI Guide Type 17, with a minimum 1-year term, as described in the Company s Service Publication and Price Guide located on the Company s Internet site at Customer must also subscribe to the Verizon Business Services Versatile T1 offering as described in MCI Communications Services, Inc. d/b/a Verizon Business Services Tariff B.P.U. - N.J. No. 1 ( Companion Intrastate Service ). Customer is not eligible to receive the benefits of any other program or promotion related to local, long distance, conferencing or internet dedicated access services. Benefits Package A: Customers who subscribe to Versatile T1 service with a minimum 8 circuits and a maximum 12 circuits will receive the monthly recurring charges detailed below. Package B: Customers who subscribe to Versatile T1 service with a minimum 13 circuits and a maximum 18 circuits will receive the monthly recurring charges detailed below. Package C: Customers who subscribe to Versatile T1 service with a minimum 19 circuits or a maximum 24 circuits will receive the monthly recurring charges detailed below. 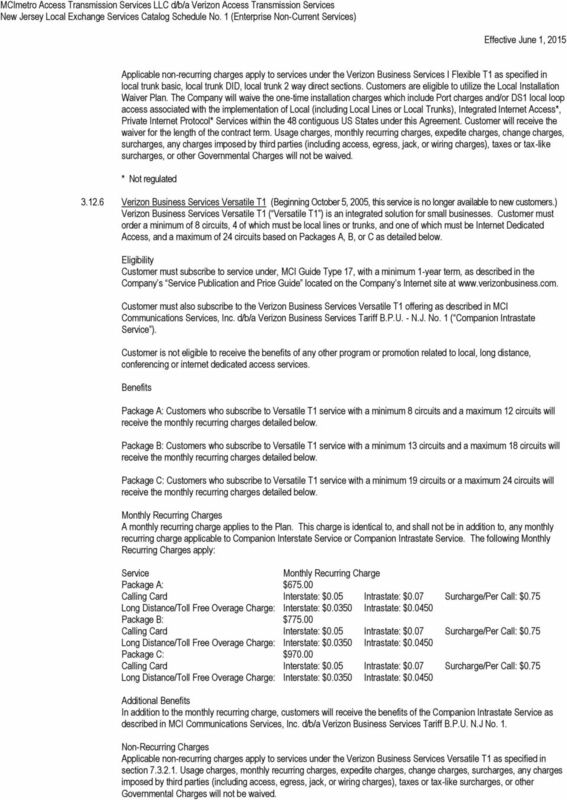 Monthly Recurring Charges A monthly recurring charge applies to the Plan. This charge is identical to, and shall not be in addition to, any monthly recurring charge applicable to Companion Interstate Service or Companion Intrastate Service. The following Monthly Recurring Charges apply: Service Monthly Recurring Charge Package A: $ Calling Card Interstate: $0.05 Intrastate: $0.07 Surcharge/Per Call: $0.75 Long Distance/Toll Free Overage Charge: Interstate: $ Intrastate: $ Package B: $ Calling Card Interstate: $0.05 Intrastate: $0.07 Surcharge/Per Call: $0.75 Long Distance/Toll Free Overage Charge: Interstate: $ Intrastate: $ Package C: $ Calling Card Interstate: $0.05 Intrastate: $0.07 Surcharge/Per Call: $0.75 Long Distance/Toll Free Overage Charge: Interstate: $ Intrastate: $ Additional Benefits In addition to the monthly recurring charge, customers will receive the benefits of the Companion Intrastate Service as described in MCI Communications Services, Inc. d/b/a Verizon Business Services Tariff B.P.U. N.J No. 1. Non-Recurring Charges Applicable non-recurring charges apply to services under the Verizon Business Services Versatile T1 as specified in section Usage charges, monthly recurring charges, expedite charges, change charges, surcharges, any charges imposed by third parties (including access, egress, jack, or wiring charges), taxes or tax-like surcharges, or other Governmental Charges will not be waived. 16 Customers are eligible to receive Verizon Business Services I Local discounts, or Verizon Business Services II Local discounts on top of the monthly recurring charge for: Local( Local Lines or Local Trunks), Integrated Internet Access, and Private IP service. Additional benefits In addition to the monthly recurring charge, customers will receive the benefits of the Companion Intrastate Service as described in MCI Communications Services, Inc. d/b/a Verizon Business Services N.J.B.P.U. Tariff No. 3. 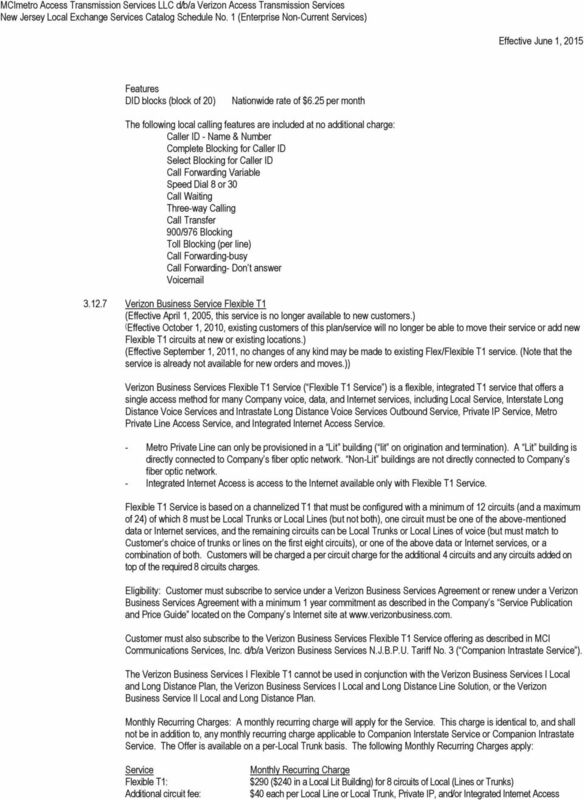 Non-Recurring Charges: Applicable non-recurring charges apply to services under the Verizon Business Services I Flexible T1 as specified in local trunk basic, local trunk DID, local trunk 2 way direct sections. Customers are eligible to utilize the Local Installation Waiver Plan. The Company will waive the one-time installation charges which include Port charges and/or DS1 local loop access associated with the implementation of Local (including Local Lines or Local Trunks), Integrated Internet Access*, Private Internet Protocol* Services within the 48 contiguous US States under this Agreement. 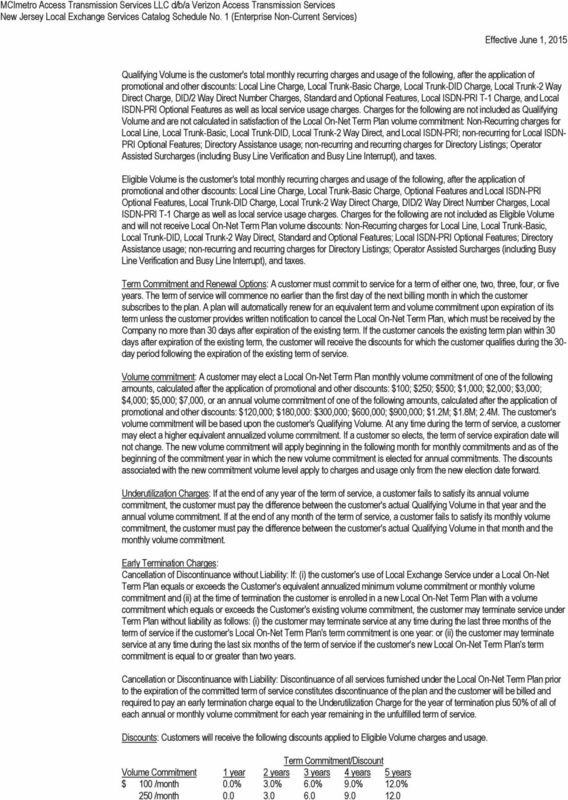 Customer will receive the waiver for the length of the contract term. Usage charges, monthly recurring charges, expedite charges, change charges, surcharges, any charges imposed by third parties (including access, egress, jack, or wiring charges), taxes or taxlike surcharges, or other Governmental Charges will not be waived. * Not regulated Local T1/PRI Lit Building Plan (Beginning February 1, 2007, this service is no longer available to new customers.) Offer: Customer will receive a monthly recurring charge (Plan Charge) of $ for Local T1/PRI service. Eligibility: Customer must: -Be a new or existing customer adding new circuits into Lit Buildings; -Be located and provision in a building connected via Company owned fiber to the Company s network (Lit Building); -Receive service under Verizon Business Service II Local which receives the benefits of this plan under a term of service which equals or exceeds one year; -Represent the Company s satisfaction, as determined with the company s sole discretion, that it would not permit conversion of facilities without further inducement; and -Agree to allow the Company and its subcontractors and their respective employees and agents access to Customer or Authorized User premises at which service is being or will be provided (including access to associated equipment). Other Conditions: Customer may not receive the benefits of Verizon Loyalty Plus I, Verizon Loyalty Plus II, Verizon Loyalty Plus III, Local T1 Rewards and VBS II Local Availability Enhancement Plans or any discounts on the monthly recurring charges that receive the benefits of this plan Verizon Loyalty Plus I Plan (Beginning July 1, 2007, this service is no longer available to new customers.) 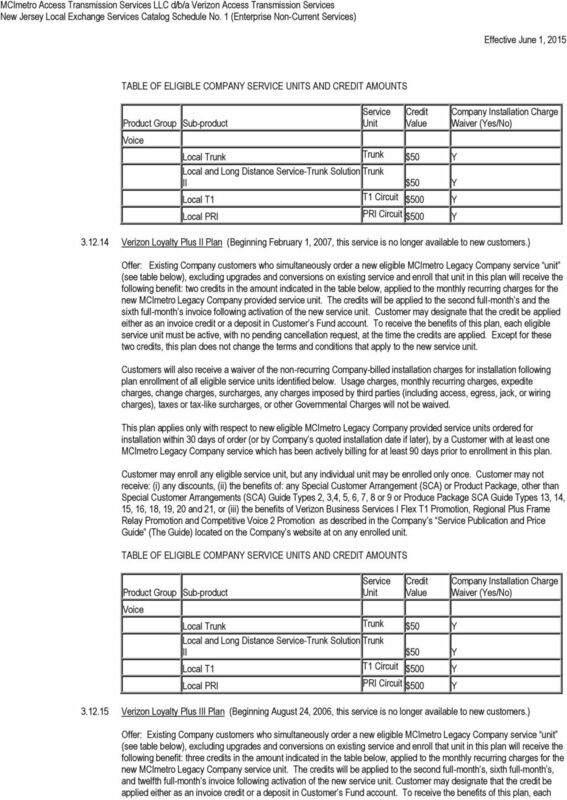 Offer: Existing Company customers who simultaneously order a new eligible MCImetro Legacy Company service unit (see table below), excluding upgrades and conversions on existing service and enroll that unit in this plan will receive the following benefit: a one-time credit in the amount indicated in the table below, applied to the monthly recurring charges for the new MCImetro Legacy Company-provided service unit. The credit will be applied to the second full-month s invoice following activation of the new service unit. Customer may designate that the credit be applied either as an invoice credit or a deposit in Customer s Fund account. To receive the benefits of this plan, each eligible service unit must be active, with no pending cancellation request, at the time the credit is applied. 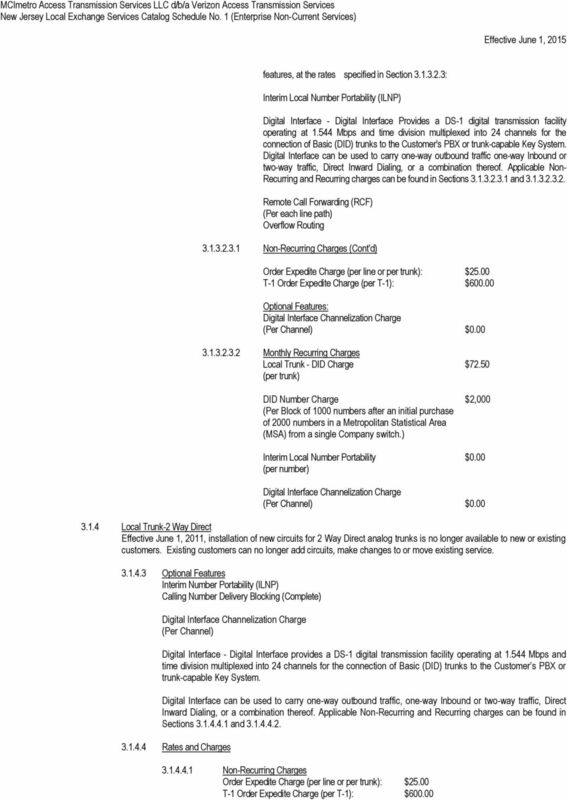 Except for this one-time credit, this plan does not change the terms and conditions that apply to the new service unit. 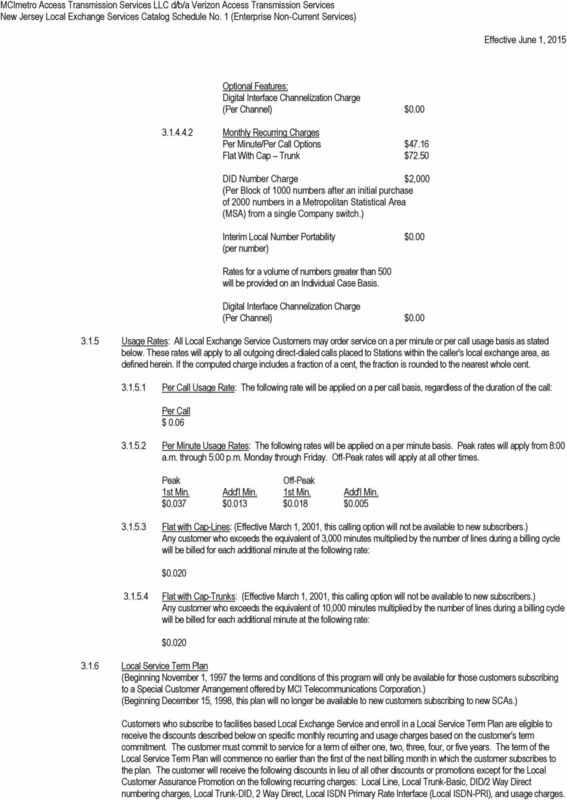 Customers will also receive a waiver of the non-recurring Company-billed installation charges for installation following plan enrollment of all eligible service units identified below. Usage charges, monthly recurring charges, expedite charges, change charges, surcharges, any charges imposed by third parties (including access, egress, jack, or wiring charges), taxes or tax-like surcharges, or other Governmental Charges will not be waived. 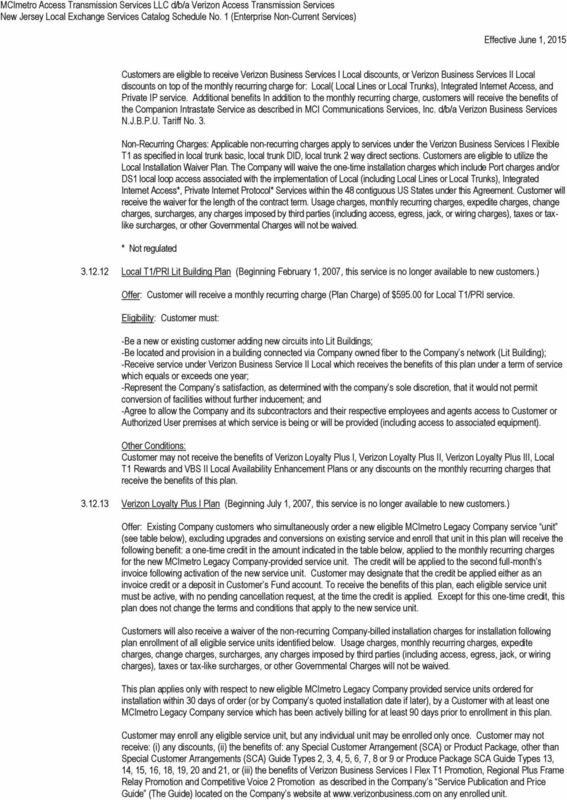 This plan applies only with respect to new eligible MCImetro Legacy Company provided service units ordered for installation within 30 days of order (or by Company s quoted installation date if later), by a Customer with at least one MCImetro Legacy Company service which has been actively billing for at least 90 days prior to enrollment in this plan. Customer may enroll any eligible service unit, but any individual unit may be enrolled only once. Customer may not receive: (i) any discounts, (ii) the benefits of: any Special Customer Arrangement (SCA) or Product Package, other than Special Customer Arrangements (SCA) Guide Types 2, 3, 4, 5, 6, 7, 8 or 9 or Produce Package SCA Guide Types 13, 14, 15, 16, 18, 19, 20 and 21, or (iii) the benefits of Verizon Business Services I Flex T1 Promotion, Regional Plus Frame Relay Promotion and Competitive Voice 2 Promotion as described in the Company s Service Publication and Price Guide (The Guide) located on the Company s website at on any enrolled unit. First Revision. Any questions regarding this Catalog Schedule, please call 1-866-665-7586. A. Service Descriptions 1. Business Connections 1000 (Product 105) Business This product is being offered to small business customers who subscribe to Cincinnati Bell Telephone's Complete Connections offering. 211 th Revised Page 2 Cancels 210 th Revised Page 2 CHECK SHEET PAGE REVISION PAGE REVISION 1 10 th Rev. 26 2 nd Rev. 2 211 th Rev. * 27 2 nd Rev. 2.1 22 nd Rev. 28 2 nd Rev. 3 43 rd Rev. 29 2 nd Rev. 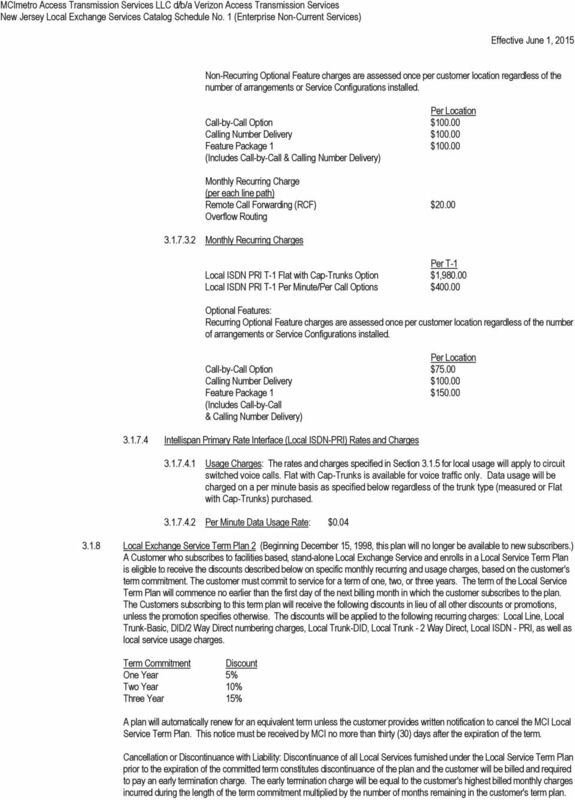 PUERTO RICO TELEPHONE COMPANY, INC. Fifth Revision - Page F-7-1 Canceling Fourth Revision - Page F-7-1. 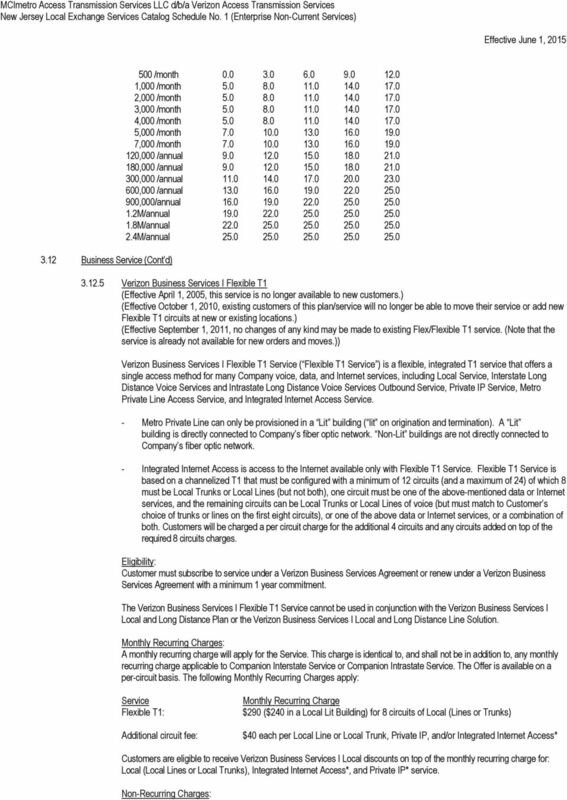 ADDITIONAL SERVICES TARIFF SCHEDULE (Cont. Original Page No. 1 AGENCY SECTION 2 EXPLANATION OF TERMS For 911 or E911 service, the government agency(s) designated as having responsibility for the control and staffing of the emergency report center. Bills will be rendered monthly to Customer. 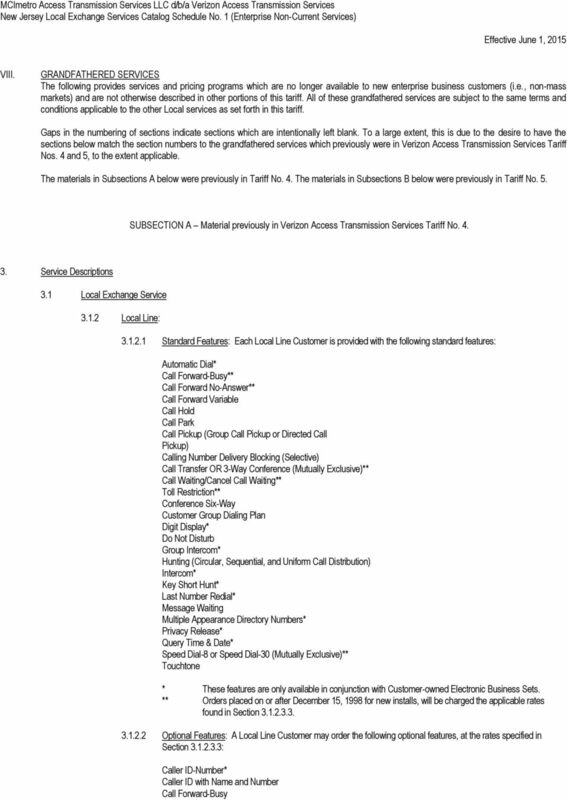 d/b/a EarthLink Business 2 nd Revised Page 1 Cancels 1 st Revised Page 1 CHECK SHEET Pages of this tariff, as indicated below, are effective as of the date shown at the bottom of the respective pages. PHILLIPS COUNTY TELEPHONE COMPANY PHILLIPS COUNTY COMMUNICATIONS, INC.
1 South Central Communications Inc. The Iowa Utilities Board has de-tariffed rates in Local Exchange Tariffs and Intrastate Access Tariffs of non-rate regulated company s effective 01/29/06 in RMU-05-6. By: John D. Scanlan, President & Vice Chairman Issued: October 24, 2001 Effective: November 7, 2001 GENERAL EXCHANGE SERVICES TARIFF NO. 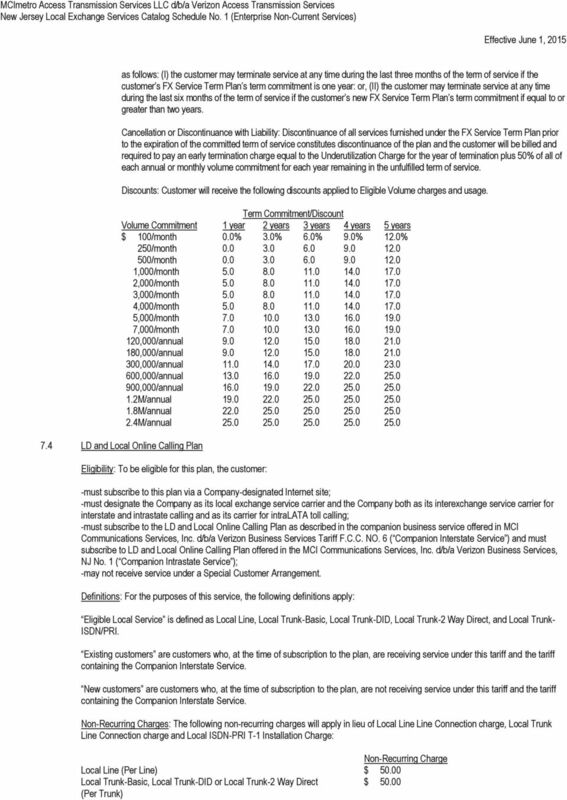 Rates Schedule Original Sheet 1 Description of Services The following Direct Dialed Intrastate Long Distance Message Telecommunications Services are available at the rates listed under Rates for Services.